This is Italy's largest (370 sq. 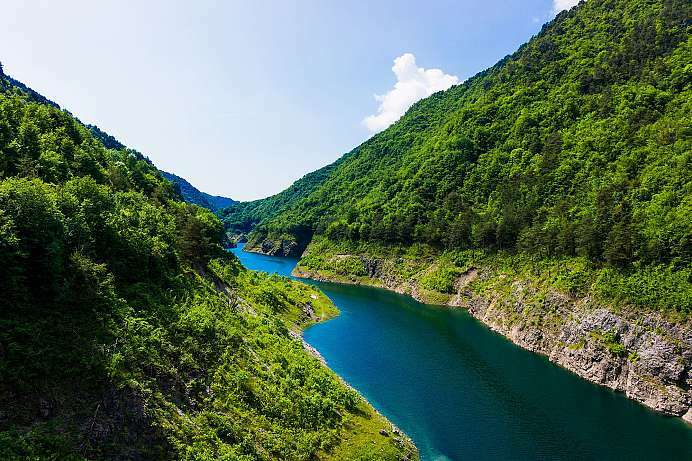 km) and undoubtedly most beautiful lake. The northern end is surrounded by mountains (Mt. Balbo), its southern end by gentle hills. The lake's climate is temperate and its flora is characteristically Mediterranean, a combination that has made it famous and its small Riviera-like towns (Malcesine, Brenzone, Torri del Benaco, Bardolino, Lazise, Peschiera) highly frequented tourist stops since ancient times. There are several natural parks in the region of Peschiera and Castelnuovo del Garda that rank among the most famous in Europe. However, this is also a region of fertile countryside with fine wine that once attracted kings, merchants and cardinals. Recreational activities such as sailing, motor boating and water-skiing are offered. Most Lake Garda towns feature a jetty where excursion- and speed-boats land. Information on times and prices can be obtained during a walk along the promenade. Generally speaking it is not necessary to reserve, as the boats run approximately every 30 minutes to an hour. And if a boat is too crowded then you just take the next one. 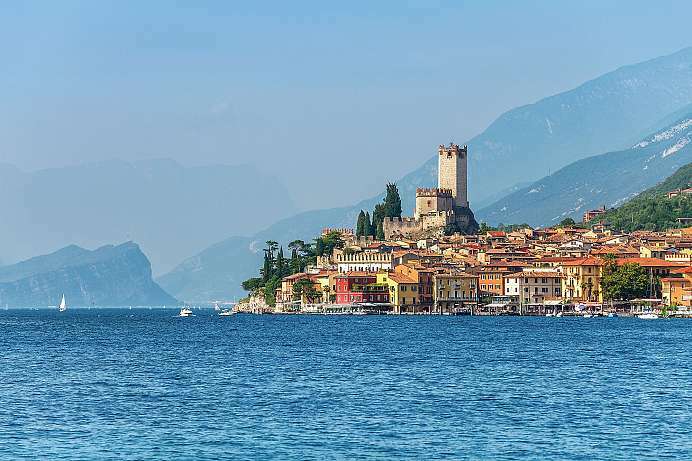 The picturesque town on the western shore is considered the most elegant holiday resort at Lake Garda. Exquisite restaurants and cafes await on the waterfront. Within the sizable botanical gardens (10,000 square meters) grow more than 2,000 plant species, including subtropical ones thanks to the mild climate. The Vittoriale degli Italiani was the residence of the Italian poet Gabriele D'Annunzi. Today the complex is a spacious museum on an area of nine hectares. From Gargnano a steep panoramic road leads up to Lago di Valvestino. It travels through the romantic and wild landscape of the Parco Regionale Dell Alto Garda Bresciano. Along the way one continually passes spots with great views of Lake Garda. The reservoir itself looks more like a Norwegian fjord. Restrained by Monte Bagno, Monte Alberelli, and Monte Carzen it has crystal clear water. Around the lake are a number of marked trails. 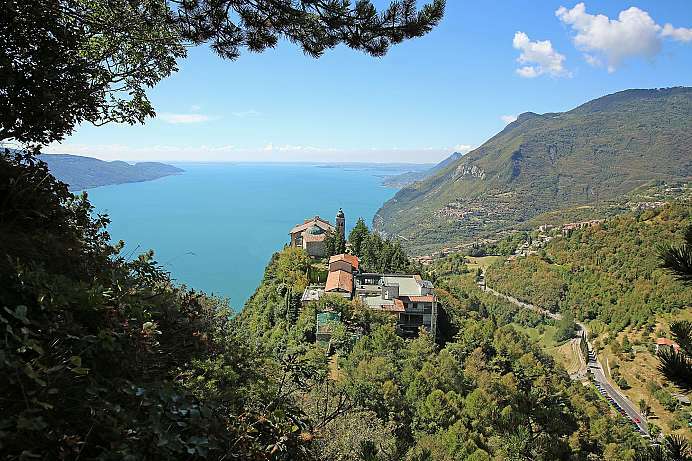 The pilgrimage church dating back to the 17th century is perched in a breathtaking location 700 meters above Lake Garda: a steep cliff dropping down into the lake almost vertically. Inside one can find a golden altar and a number of beautiful frescoes. From the monastery behind the church a path leads up to the summit. From here one has a sweeping vista of Monte Baldo and the Castle of Malcesine on the other side. 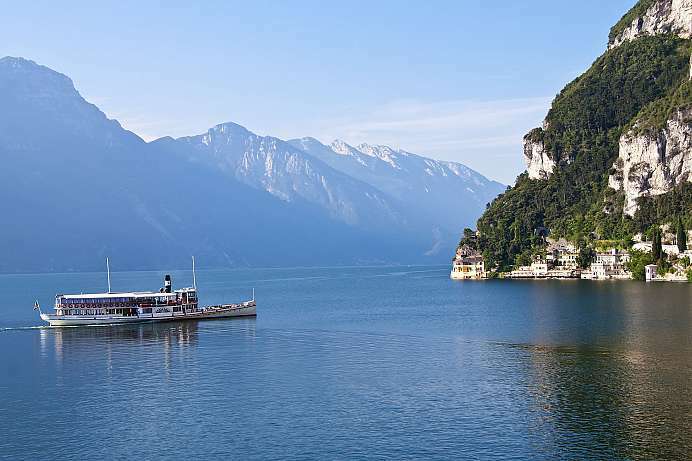 The more than 2,000 meters high, elongated ridge offers beautiful views across the Adige Valley and Lake Garda. Especially the protected eastern slope is a treasure trove for botanists. Some plant species are endemic, meaning they only occur here, one example being the Monte Baldo sedge. Hiking trails of various lengths and difficulty lead over the mountain. 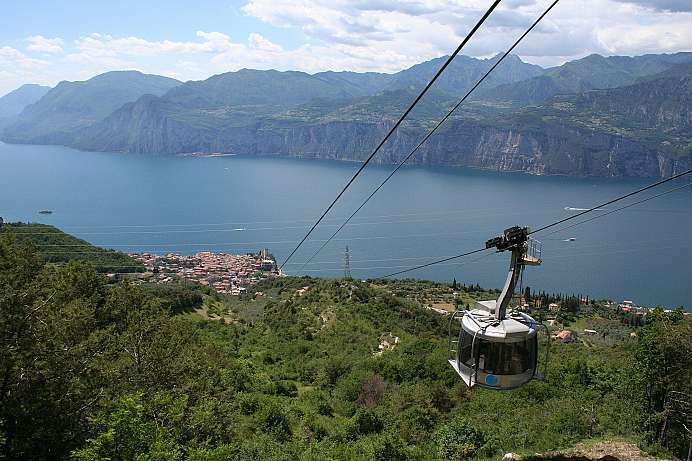 From Malcesine a cable car runs to the summit, which is used by tourists, hikers and mountain bikers. 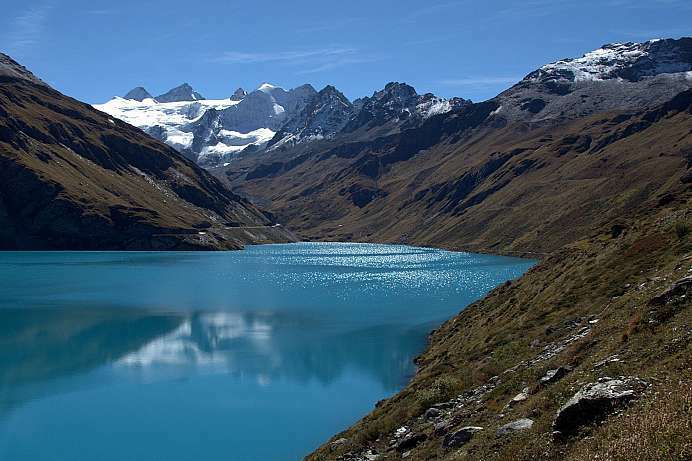 Because of the enormous difference in height, the mountain is also popular with paragliders. The small peninsula between Garda and Torri del Benaco at the foot of Mount Baldo extends into Lake Garda. 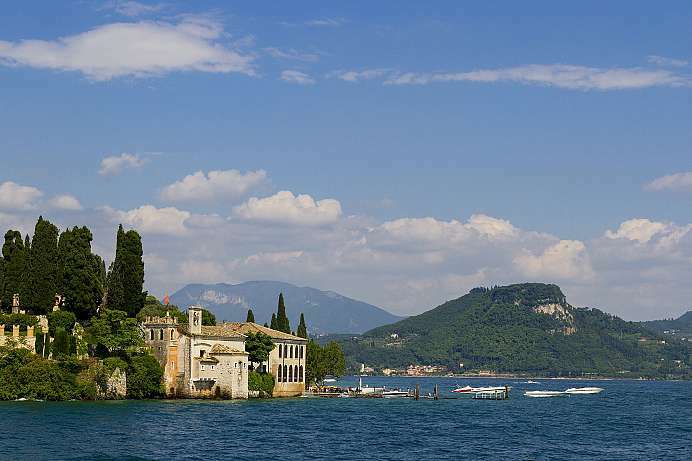 The Punta, Italian for point or tip, today consists of the Villa Guarienti di Brenzone, the Locanda San Vigilio with a church of the same name and a small harbor with a café. On the shores to the north is the Baia delle Sirene (Bay of the Sirens), which is considered to be the most beautiful bathing bay of the whole lake. 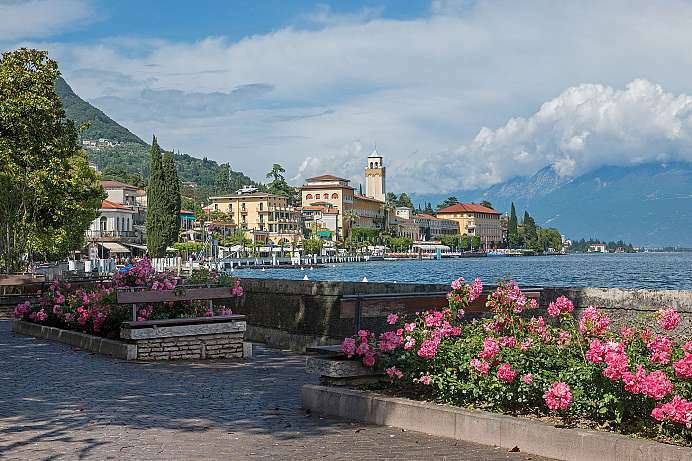 This town on a headland in the southern part of Lake Garda is among the most beautiful towns in all of Lombardy. 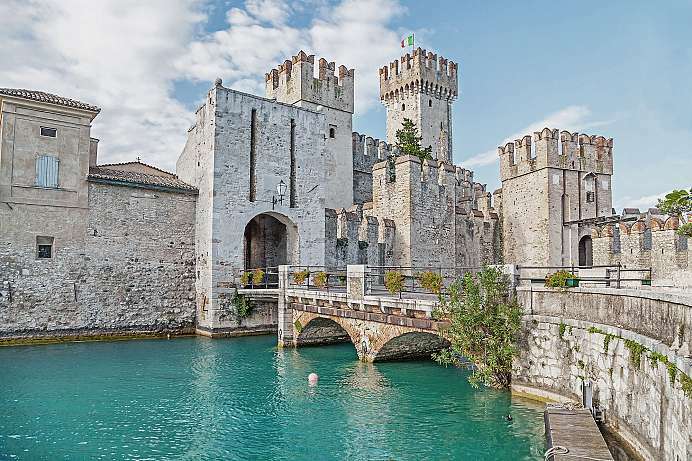 Sirmione belongs to the district of Brescia in the Italian region of Lombardy. Its idyllic old town is closed to cars. The narrow alleys and secluded squares are lined with boutiques, antique shops, cafes and restaurants. A magnificent moated castle stands a the entrance to the town.